There are so many diets out there, and books on how to lose weight. While some might take the weight off for a time, others will have you just losing water weight and are a very quick fix that won't last long term. Before I was a trainer, I was on and off the diet wagon based on which book was a best seller at the time. Thanks to the South Beach diet, eating a strawberry threw me into a tailspin. Many years ago, I was in search of the perfect diet that would help me shed all the baby weight I gained while prego with baby #2. In Phase 1 of the South Beach Diet, fruit is off limits completely. I did ok for the first day or two, but on day 3, had a strawberry and quickly fell into the thinking everyone has while on these things..."now I've blown it for the day - might as well eat what I want since I already screwed up". I had never cared much about the bakery at the grocery store either, until I started South Beach! While it is true that you will lose weight with this diet, it put my mind into that "Diet" mode that is not healthy and seems restrictive. I was probably off and on phase 1 of South Beach for 2-3 years. It wasn't until I stopped trying these types of "diets" and learned how to eat healthy foods, that I was able to start losing the weight. 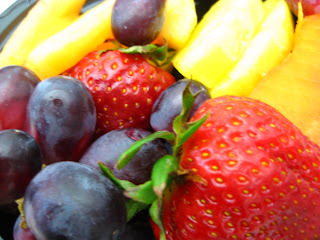 Fruit is natures dessert ~ enjoy! Check out our GROUPON deal of the day HERE!